Bengaluru: Tata Consultancy Services Ltd (TCS), Infosys Ltd and Wipro Ltd face twin challenges in muted growth in traditional business offerings even as their growth in digital areas pales in comparison with Accenture Plc, underlining the struggle faced by India’s three largest information technology outsourcing companies in this two-speed world of digital and non-digital. 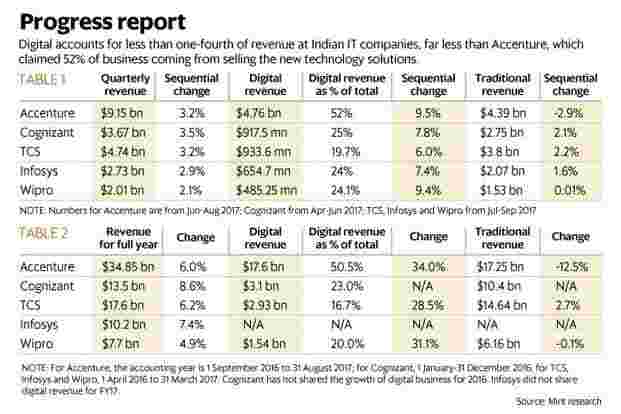 Digital, the fuzzy and umbrella term which each company uses to classify revenue generated from areas generally classified as social, mobile, analytics, cloud computing and Internet of Things, accounts for less than a fourth of revenue at Indian IT companies, far less than Accenture, which claimed 52% of business coming from selling these new technology solutions (see table 1). Accenture’s new and digital revenue reported a 9.5% sequential jump to $4.76 billion in the fourth quarter ended August. Accenture, which follows the September-August financial year, grew 6% to end fiscal 2017 with $34.9 billion in revenue, with new revenues alone totalling $18 billion. This means Accenture’s $18 billion new revenue is more than the entire business TCS did last year. In the June-August quarter, Accenture’s new business alone was more than TCS’s $4.74 billion revenue in the September quarter. This explains why despite reporting a 2.9% sequential decline, on the back of a 12.5% drop in legacy business last year, Accenture still managed to grow almost on par with Indian rivals: Accenture’s 6% dollar revenue growth last year is a shade less than the 6.2% growth recorded by TCS. Infosys grew 7.4% and Wipro managed a 4.9% growth in 2016-17 (see table 2). Already, a few analysts like Keith Bachman of BMO Capital Markets estimate Accenture to grow faster than Indian IT services firms in the current financial year while some others believe that a relative underperformance could impact the firm’s revenue growth and interest among shareholders. “Indian IT players now have two distinct parts to their portfolios: the legacy portion (55-83% of FY17 revenue) that is barely growing, and the smaller ‘new’ portion that is growing 20-30% y-o-y. Thus, how fast the ‘new’ grows and how well the slowdown in the legacy part is arrested could decide how revenue growth and valuations play out over the medium term," BNP Paribas analyst Abhiram Eleswarapu wrote in a note earlier this year. Considering most Fortune 1000 firms are cutting their spend on legacy work such as application maintenance, and ploughing the savings on newer projects in areas such as data analytics and cyber security solutions, Indian IT services firms need to strengthen their offerings in these areas. “Digital parts of the business grow 2-3 times faster than the rest of the business , and this is simply driven by increased client demand for digital services," said Ralf Dreischmeier, London-based head of technology practice at Boston Consulting Group. For now, Indian companies are finding it challenging. At the heart of Accenture’s better performance is the strong consulting practice and aggressive investments in new technology areas like cloud computing, data analytics and design capabilities: Last year saw Accenture spending $1.7 billion to buy 37 companies. This is more than the $1.58 billion spent by TCS, Infosys and Wipro together since 1 April 2014. “Clients are realizing their IT costs have hit rock bottom and the only way to get additional value is to demand digital expertise embedded into legacy relationships," said Phil Fersht, chief executive of US-based HfS Research, an outsourcing-research firm. This building of newer solutions like data analytics as part of legacy projects offers outsourcing companies to sell solutions in areas like software testing. “I think it’s important to say that traditional business is an important enabler for digital. Because of exception of what you call as digital natives, the other companies, which are majority of the world, which are digital immigrants, are all building digital on top of the traditional technology backbone," Francisco D’Souza, chief executive officer of US-based Cognizant Technology Solutions Corp, said in an interview earlier in August. A spokesperson for Cognizant clarified that its platform solutions business, including that of Trizetto acquisition, and revenue from business process services, are not part of digital revenue of traditional business.